Gliński's hexagonal chess, launched in 1949, became popular in Eastern Europe, reaching half a million fans. Three cell colours and three bishops per side are the norm for hexagonal variants. Hexagonal chess refers to a group of chess variants played on boards composed of hexagon cells. The best known is Gliński's variant, played on a symmetric 91-cell hexagonal board. Since each hexagonal cell not on a board edge has six neighbor cells, there is increased mobility for pieces compared to a standard orthogonal chessboard. (E.g., a rook has six natural directions for movement instead of four.) Three colours are typically used so that no two neighboring cells are the same colour, and a colour-restricted game piece such as the orthodox chess bishop usually comes in sets of three per player in order to maintain the game's balance. Many different shapes and sizes of hexagon-based boards are used by variants. The nature of the game is also affected by the 30° orientation of the board's cells; the board can be horizontally (Wellisch's, de Vasa's, Brusky's) or vertically (Gliński's, Shafran's, McCooey's) oriented. 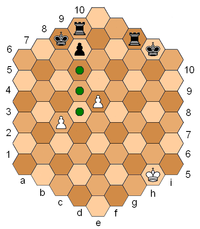 (E.g., when the sides of hexagonal cells face the players, pawns typically have one straightforward move direction. If a variant's gameboard has cell vertices facing the players, pawns typically have two oblique-forward move directions.) The six-sidedness of the symmetric hexagon gameboard has also resulted in a number of three-player variants. The first applications of chess on hexagonal boards probably occurred mid-19th century, but two early examples did not include checkmate as the winning objective. 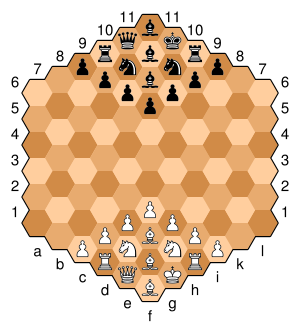 More chess-like games for hexagon-based boards started appearing regularly at the beginning of the 20th century. 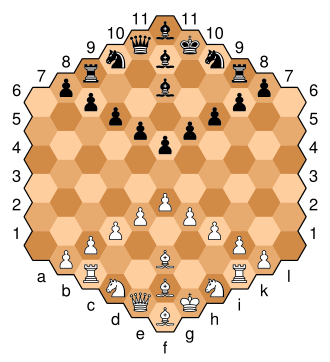 Hexagon-celled gameboards have grown in use for strategy games generally; for example, they are popularly used in modern wargaming. Gliński's hexagonal chess, invented by Władysław Gliński in 1936 and first launched in Britain in 1949, is "probably the most widely played of the hexagonal chess games". The game was popular in Eastern Europe, especially in Gliński's native Poland. At one point there were more than half a million players, and more than 130,000 board sets were sold. Gliński's book Rules of Hexagonal Chess was published in 1973. The game is played on a vertically oriented regular hexagonal board with sides 6 cells long, which has 91 hex cells having three colours (light, dark, and mid-tone), with the middle cell (or "hex") usually mid-tone. The usual set of chess pieces is increased by one bishop and one pawn. The board has 11 files, marked by letters a–l (letter j is not used), and 11 numbered ranks (which bend 60° at file f). Ranks 1–6 each contain 11 cells, rank 7 (filled with black pawns in the initial setup) has 9 cells, rank 8 has 7, and so on. Rank 11 contains exactly one cell: f11. The diagrams show how each piece moves. As in orthodox chess, the knight can jump over other pieces，but unlike orthodox chess, two knights can mate a king and also a knight can triangulate. A player's three bishops, relegated to different colours, can never meet. The queen moves as rook plus bishop. There is no castling in Gliński's chess. Pawns move straight forward and capture obliquely forward to an adjacent cell (shown as crosses in the diagram); the pawn's capturing move direction is not diagonal like the bishop's move, as is the case in standard chess. All pawns can make a double step from their starting cells. If a pawn captures from its starting cell in such a way that it then occupies a starting cell of another pawn, it can still make a double move. For example, if the pawn on e4 were to capture a black piece on f5, the pawn retains the option to move to f7. The white pawn in the middle file (cell f5) cannot make a double step in the initial setup, since the target cell is occupied (a black pawn is on f7), but the double-step move could be made later when the cell is empty. En passant captures are also possible: for example, if the black pawn on c7 in the diagram moves to c5 in a single move, the white pawn on b5 can capture it: bxc6. Pawns promote on the last cell of a file; white pawns promote on the cells in the diagram marked with stars. Stalemate is not a draw in Gliński's chess, but is still counted less than checkmate. In tournament games, the player who delivers stalemate earns ¾ point, and the stalemated player (the player without a legal move) receives ¼ point. A numeric (or international) notation exists. Every other detail is exactly as in ICCF numeric notation, except that there is no castling. 1976. June: First Hexagonal Chess Congress at Bloomsbury Centre Hotel, London, which included the inauguration of the British Hexagonal Chess Federation and the first British Hexagonal Chess Championship. David Springgay took the title. (Deceased 12.2.18) December: First issue of "Hex Press" (Hexagonal Chess News) published. 1977. Hexagonal Chess was topic for many newspapers and magazines in Poland and other Eastern European countries. December: Second British Championship held at Clifton-Ford Hotel, London. Brian Rippon took the title. 1978. January: Inventor visited Poland. Successful Hexagonal Chess event staged. Wide publicity in Eastern Europe. `Wspolna Sprawa' produced and distributed over 90,000 inexpensive sets in 18 months. September: First International Team Match – Poland vs. Great Britain at Central Hall, Westminster, London. Event shown on BBC and Australian TV, reported in press at home and abroad – including Japan. 1979. July: Third British Championship held at Polish Cultural Institute, London. Title taken by Simon Triggs, nearly 16 years old. August: Return International Team Match – Poland vs. Great Britain in Warsaw. Sponsored by magazine "Horyzonty Techniki" (which includes a regular column on Hexagonal Chess). Whilst in Poland, Simon Triggs played the first mixed (6 square and 6 hexagonal boards) simultaneous display. Hexagonal Chess clubs formed in Poland, Czechoslovakia and USSR. 1980. August: International Congress at Polish Cultural Institute, London, which included: Inauguration of International Hexagonal Chess Federation, First European Championship, Team Match: Poland v Great Britain Countries taking part: Austria, Great Britain, Hungary and Poland. Event covered by BBC TV and newspapers at home and abroad, including USSR ("Komsomolskaya Pravda" – 10,500,000 circulation), Austria and Hungary. Also radio in USA. First four places: 1: Marek Mackowiak (Poland), 2: Laszlo Rudolf (Hungary), 3: Jan Borawski (Poland), 4: Piers Shepperson (Great Britain). 1981. September: First Hungarian Hexagonal Chess Championship in Szekszard. Title taken by Laszlo Sziraki. Fourth British Championship held at Woodford Bridge, Essex. Local and National press coverage, including picture in "The Times". Four players tied for first place. Final playoff arranged for October. October: Playoff held in association with the North London (square-board) Congress, when Simon Triggs retained his title. 1982. April: Second Hungarian Championship held in Miscolc. Laszlo Rudolf became the Hungarian Champion for 1982. June: Final agreement and arrangements completed with "Bohemia" in West Germany regarding production of a new complete Hexagonal Chess boxed game with roll-up double-sided board (hexagonal/square) and wooden pieces to be distributed in the West European market. July: An open Hexagonal Chess Tournament was held on 10 and 11 July in the famous Sokolniki Park in Moscow. Players from Moscow and elsewhere in the USSR took part in the competition. First place and the "Moscow Trophy" were taken by F. Goncharov. Second was S. Seryubin and Third V. Goltyapin. Judging from the reports received, this tournament has considerably accelerated the development and popularity of Hex Chess in the USSR. Further tournaments, including international team matches (over-the-board and correspondence) are being organized. Open International Tournament held in Pecs, Hungary, 24–31 July. This tournament was organized by the President of the Hungarian Hexagonal Chess Association, Mihaly Gelencser, and sponsored by the Zsolnay porcelain factory in Pecs, which also donated the "Zsolnay Cup" as well as other prizes of porcelain figures. The winner of the Tournament was Laszlo Rudolf (Hungary). Second place was taken by Simon Triggs (Great Britain). September: Fifth British Championship held in London. Simon Triggs (19) of Garston, Hertfordshire, won the title of British Hexagaonal Chess Champion for the third time in succession. Press Association attended and wrote lengthy background. All the "quality newspapers" took photographs. LBC Radio and BBC Radio London broadcast interviews. Invented by Soviet geologist Isaak Grigorevich Shafran in 1939 and registered in 1956. It was demonstrated at the Worldwide Chess Exhibition in Leipzig in 1960. The board is shaped as an irregular hexagon with nine files and ten ranks, comprising 70 cells as opposed to 91 in Gliński's board. The files are labelled a to i; the oblique ranks running diagonally from 10 to 4 o'clock are numbered 1 to 10. For example (see diagram), the two kings start on e1 and e10; White's rooks start on a1 and i5, and Black's rooks start on a6 and i10. Each player calls the left-hand side of the board his "queen's flank" and the right-hand side his "bishops' flank"; note that they do not correlate (White's queen's flank is Black's bishops' flank). All pieces except pawns move and capture exactly as in Gliński's chess. In Shafran's chess, a pawn's first move can take it to the middle of the file. (So, the d-, e-, and f-pawns can make a three-step initial move; the b-, c-, g-, and h-pawns can make a double-step initially; and the a- and i-pawns can advance only one step.) A pawn captures diagonally like a bishop, but one step away (one rank and one file). When a pawn makes a multi-step move, it is subject to capture by en passant. In the diagram, the black pawn on d8 has three possible moves, but none is safe: after 1... d7 it can be captured 2. exd7; after 1... d6 it can be captured 2. exd7e.p. or 2. cxd6; after 1... d5 it can be captured en passant by either pawn. Castling is permitted in Shafran's chess (unlike Gliński's or McCooey's). The usual restrictions apply. It can be long or short castling in either direction. The notation consists of Q- or B- (indicating whether the queen's or the bishops' rook is used) followed by 0-0-0 (long castling: the king moves next to the rook and the rook jumps over it) or 0-0 (short castling, the king moves one cell less distance). In the diagram, the black king on h10 has castled long queenside (1... Q-0-0-0) and the black king on c8 has castled short bishopside (1... B-0-0). Castling does not typically increase the king's safety or make the rook more active, but it is present in the game nonetheless, for completeness. Stalemate is a draw in Shafran's chess. De Vasa's hexagonal chess, starting position. This array of pieces on the players' first ranks was first proposed by de Vasa. Invented by Helge E. de Vasa in 1953 and first published in Joseph Boyer's Nouveaux Jeux d'Echecs Non-orthodoxes (Paris, 1954). The rhombus-shaped board comprises 81 cells with initial setup as shown, in the revised form of the game. Rules for piece movement are the same as Gliński's variant, except for the pawns. Castling is permitted, and kings start on opposite wings of the board. Players may castle either short (0-0) or long (0-0-0). The king slides two cells when castling short; three cells when castling long. Other standard chess castling rules and restrictions apply. Pawns start on the players' third ranks. A pawn moves forward to an adjacent cell, or (as its first-move option), two cells forward in the same direction. A pawn captures diagonally forward to the sides (to a cell of the same colour on which the pawn stands). The white pawn on b3, since it has not yet moved, has four move options (green dots) and two ways to capture (red dots). The white pawn on g5 has moved from its initial cell, so has two move options and two ways to capture. If Black moves his f7-pawn to either f6 or f5, White can capture it, for example: 1... f7-f5 2. g5xf6e.p. In the diagram, White has castled short (0-0) and Black has castled long (0-0-0). Brusky's hexagonal chess, starting position. The first-rank piece array was first proposed by Helge E. de Vasa (see De Vasa's hexagonal chess). Invented by Yakov Brusky in 1966. The game features an irregular hexagon board comprising 84 cells. Piece movement rules are the same as Gliński's chess, except for the pawns, of which there are ten instead of Gliński's nine. Other differences from Gliński's: castling is permitted; kings start on opposite wings of the board; and draws are worth half a point. Players may castle either short (0-0) or long (0-0-0). The king slides two cells when castling short; three cells when castling long. Normal castling rules and restrictions apply. As in algebraic notation, each cell is identified by a letter+number combination. Ranks are horizontal and identified by numbers 1–8. files are straight and 30° oblique to the vertical, identified by letters a–l. Moves can be recorded in long algebraic notation (LAN) to avoid confusion, for example: 1. d2-f4 rather than 1. df4. A pawn moves forward to an adjacent cell, or (as its first-move option), two cells forward in the same direction. If an enemy man blocks a pawn from moving in one of its two forward move directions, then that pawn is automatically blocked from moving in the other direction as well. But if the blocking man is a friendly piece the effect is not the same—the pawn is still free to move in the unblocked direction. The white pawn on c2, since it has not yet moved, has four move options (green dots) and three ways to capture (red dots). The white pawn on i3 has moved from its initial cell, so has two move options and two ways to capture. The white pawn on g5 and black pawn on h6 block each other from any forward moves. But if Black moves his f7-pawn to either f6 or f5, White can capture it, for example: 1... f7-f5 2. g5xf6e.p. A pawn captures diagonally forward, to a cell of the same colour on which the pawn stands. But only a pawn on its initial cell may capture straight forward; once a pawn has moved, it may capture only to the sides. (So, unless it is a wing pawn, an unmoved pawn has three capturing possibilities; a pawn that has moved, two.) En passant captures are permitted in Brusky's chess. king + bishop + knight can checkmate a lone king. In 1978–79 Dave McCooey and Richard Honeycutt developed another variation of hexagonal chess very similar to Gliński's, having four differences: the starting array (including seven pawns per side instead of nine); the pawn's capturing move; pawns on the f-file are not permitted an initial double step; and stalemate is counted as a draw (players receive half a point). This diagram shows the pawn's move in McCooey's variant. The capturing move corresponds to a bishop's move: e.g. if the black pawn on e8 advances to e6, the white pawn on d5 may capture it en passant. In the starting position, the f-file pawns may not advance two steps like the other pawns. The f-pawns are also not defended in the opening array, and in fact smothered mate would result if it were captured by a knight, although this possibility would rarely occur in practical play. king + rook can checkmate a lone king. Starchess is a hexagonal variant invented by Hungarian chess teacher László Polgár. The board is a horizontally oriented regular hexagram, consisting of 37 numbered cells. Due to the small board, games typically finish quicker than in standard chess. Each player has five pawns, a king, knight, bishop, rook, and queen. The white pawns start at cells 5, 12, 18, 23, and 29; the black pawns at 9, 15, 20, 26, and 33. At the beginning of the game, the players place their other pieces alternately on the cells behind their pawns (White: 4, 11, 17, 22, 28; Black: 10, 16, 21, 27, 34). As a consequence, there are (5! )²=14400 possible setups. Pawns move one step vertically forward and capture one step orthogonally left-forward or right-forward, and have an initial double-step option (identical to Gliński's pawn); there is no en passant. The promotion zone for white pawns consists of Black's back rank (cells 10, 16, 21, 27, and 34), and for black pawns, White's back rank (cells 4, 11, 17, 22, and 28). A pawn that has lost its initial double-step option by making a capture is called a "limping pawn"; a pawn that ended up on cells 2, 3, 35, or 36 is called a "dead pawn"; a pawn on cells 1 or 37 is called a "mummy". The king moves one step in any orthogonal direction; there is no castling. The knight jumps, two steps in any orthogonal direction, followed by one step in a different direction (identical to Gliński's knight). The rook can move any number of steps, but only vertically; the bishop can move any number of steps, but not vertically. The queen combines the moves of the rook and the bishop, and thus can move any number of steps in any orthogonal direction (identical to Gliński's rook). The first published hexagonal chess variant was the commercial game Hexagonia, invented in 1864 by John Jaques & Son. 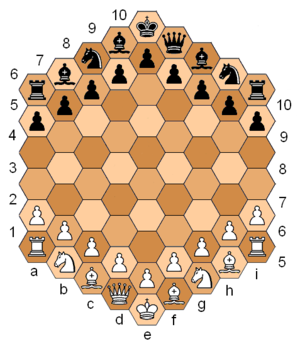 The board has 127 cells; each side has 1 king, 2 cannons, 4 knights and 8 pawns. The winning objective is not checkmate, but rather to safely bring one's king to the central board cell. Siegmund Wellisch published a three-player Wellisch's hexagonal chess variant in 1912. The board is a regular hexagon with sides of length 6, which consists of 91 cells; however, it is oriented horizontally. Each side has eight pawns, three knights, two rooks, one queen, and one king. There are no bishops. The pawn moves and attacks one step in one of two orthogonally forward directions; there is no initial double-step, nor en passant. The king moves one step in any orthogonal direction. The knight jumps one step in any diagonal direction, and is thus colour-bound. The rook moves any number of steps in one of six orthogonal directions. The queen combines the moves of a rook and a knight. Castling involves the king and a rook simply swapping places. McCooey also developed a variant called Mini Hexchess, which uses a vertically oriented regular hexagon with sides of length 4, which consists of 37 hexes. Each player has a king, a knight, a bishop, a rook, and five pawns. Mathewson's hexagonal chess uses nine McCooey's pawns, which are set up at b1, c2, d2, e3, f4, g3, h2, i2, and k1 (for White; Black's are mirrored). For everything else it is identical to Gliński's. REX chess was invented in 1997 by Arnaldo Rodrigues D’Almeida. It is played on a horizontally oriented rectangular-shaped board, which consists of 85 hexes. Kings move one step in any orthogonal direction, pawns move and attack one step orthogonally forward (two directions); all other pieces behave as in Gliński's. Setup is similar to de Vasa's, except that each side has 15 pawns, ten on the second rank and five on the third. In 1998 Derick Peterson invented Grand Hexachess. 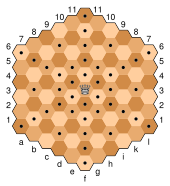 This variant uses a regular hexagon with sides of length 7, which consists of 127 hexes; the board is oriented horizontally, with each player's pieces on opposite sides. Pawns then have two possible forward moves (forward left and forward right) and three possible diagonal capturing moves (one directly in front). Precisely this was the motivation for this design, considering the fact that usually the hexagonal chess pawn is the only piece that does not increase its mobility. 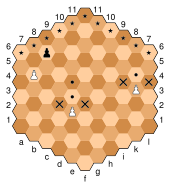 Chexs is a multiplayer variant; the version for two and three players uses a regular hexagon with sides of length 6, which consists of 91 cells, the four–six player version uses a regular hexagon with sides of length 9, which has 217 cells; pieces move as in Gliński's, but the setup is different; each player starts with only two bishops, and all bishops are on same-coloured cells. A checkmated player is defeated; the player who gave checkmate takes over control of the pieces of the defeated player; the winner is the player who has checkmated all his opponents. Echexs uses the same boards as Chexs, the same moves as Gliński's, but McCooey's setup. C'escacs 2007 is a Grand Gliński chess; the board is shaped as a regular hexagon with sides of length 8, which consists of 169 cells. In addition to the Gliński's setup, it introduces a dragon (empress, a rook+knight compound), two pegasi (princesses, bishop+knight compound) and two almogavars (a (2,0)- and (1,1)-leaper compound, i.e. it can jump either to the second square in any orthogonal direction, or move one step diagonally). Pawns' moves are increased to allow forward 60° moves (i.e. they now have three move directions instead of one), and captures are the same way McCooey's chess (i.e. they capture diagonally forward, two options). The scornful pawn capture additional rule counterbalances the excessive pawn mobility. ^ Pritchard (2007), p. 203. ^ Pritchard (1994), p. 139. ^ Hooper & Whyld (1996), hexagonal chess, p. 172. ^ Wladyslow Gliński. Rules of Hexagonal Chess. ISBN 0-904195-00-7. ^ Jelliss, G. P. (July–December 1992). "New Varieties of Hexagonal Chess". Variant Chess. Vol. 1 no. 8. British Chess Variants Society. pp. 97–112. ISSN 0958-8248. ^ Pritchard (1994), pp. 141–42. ^ Pritchard (2007), pp. 209–10. ^ Pritchard (1994), pp. 142–43. ^ Pritchard (2007), p. 210. ^ McCooey's Hexagonal Chess by Dave McCooey. ^ Endgame analysis for Hexagonal Chess by Dave McCooey. ^ a b "Polgár Starchess". ^ Pritchard (1994), p. 143. ^ Pritchard (2007), p. 297. ^ Peterson, Derick (1998-02-10). "Derick Peterson's Grand Hexachess". The Chess Variant Pages. Hooper, David; Whyld, Kenneth (1996) [First pub. 1992]. "Hexagonal Chess". The Oxford Companion to Chess (2nd ed.). Oxford University Press. p. 172. ISBN 0-19-280049-3. Pritchard, D. B. (1994). "Hexagonal Chess". The Encyclopedia of Chess Variants. Games & Puzzles Publications. pp. 138–43. ISBN 0-9524142-0-1. Pritchard, D. B. (2007). "§22 Boards based on hexagons". In Beasley, John (ed.). The Classified Encyclopedia of Chess Variants. John Beasley. pp. 203–12. ISBN 978-0-9555168-0-1. Pritchard, D. B. (1982). "Hexagonal Chess". Brain Games. Penguin Books Ltd. pp. 90–97. ISBN 0-14-005682-3. This page was last edited on 16 April 2019, at 09:36 (UTC).